Looking to match the hatch of crayfish on Table Rock. If there one particular color of jig that mimics them best or do I need to change colors with seasons. (I do not know the colors of crayfish on TRL). IF it helps, so far, I mostly fish big Indian creek & Baxter. 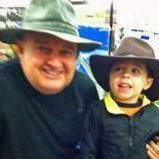 Looking to catch & release any game fish. Bill, I have never seen a PBJ ie peanut butter and jelly crayfish anywhere, but on the Rock, a Brown and Purple 1/2 or 3/8th. oz jig with a cinnamen or cinnamon/purple trailer is without equal. Army ie green pumpkin, watermellon candy, ozark craw-bit of orange in the jigs is also great. For my money right now, they seem to be hitting the craw trailers better than the grub twintails. I am using either yum or zoom in the above mentioned colors. I am dipping these in Gulp Slime and they seem to be hanging on to it better than an unscented jig. I believe right now any of the commercial proven scents are helping them hold it a little longer. Some of the smallmouth I caught the other day were spitting up a light brown and orange craws. I had one smallmouth spit up a small bluegil along with a craw when I got him to the boat. I was actually throwing a bluegil color spinnerbait with double gold willow leafs that I like to use when it is cloudy...not sure if it mattered because they were biting but pretty cool regardless. Great information. Thank you very much !!! More good information.. Are the fish still about 15 feet ? I agree with Mr Babler on the craw trailers workin better than twin tails lately. The speed craw holds up really well, and doesn't tear as easily or get bit off like some others. I've been dippin the tips of the craw in chartreuse dye. Seems to help? Similar to Bill, two of my favorite jig colors year-round are Jelly Flash and Green Pumpkin Candy. I generally use the 5/16-ounce finesse jig with a green pumpkin Lil Critter Craw by Zoom. I know lots of folks like to match the PBJ or Jelly Flash jig to a pumpkin or cinammon craw but personally, I like the green pumpkin on it. For my 5/16-ounce jigs, I use BassX jigs. They're made in Rogers, Ark. and can be seen at www.bassxlures.com. For heavier (3/8 and 1/2 ounce) ballhead and all of my football jigs, I like the War Eagle jigs, which are also made in Rogers. Their website is www.wareaglelures.com. Honestly, I have heard people catching them from 40' to a 1'. I have been catching most of my fish less than 10' but I know several people who are catching them deeper...a lot of different patterns when the water is around 60. You can't go wrong with main lake bays, inside/outside points, bluff ends or ditches...I don't like just running down a bank much but that is just me. Word: Yum watermelon candy, speaking of which I am out ! Gotta make an Acadamy run. 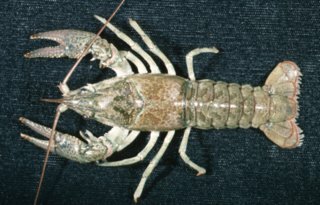 The longpincered crayfish is probably the most abundant species in Table Rock and most of the other White River reservoirs. It's also the largest crayfish you'll encounter, sometimes as much as ten inches long. I've attached a picture. They typically hang out around rocky ledges and large boulders, though they can also be found in bays and inlets. 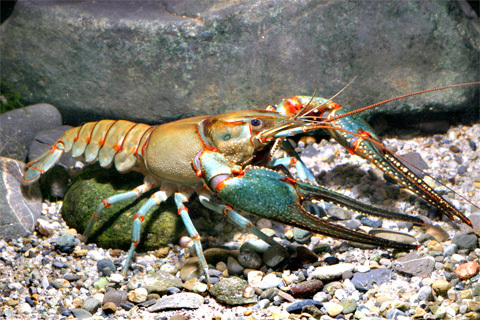 The northern crayfish is another common species-their body is typically gray mottled with dark gray or brown markings, with pincers sometimes appearing blue or green with orange tips. They're more common in calm inlets and backwaters, standing timber, and soft bottoms of organic material and mud. They're typically 3-5 inches in length, though they can get 7-8 inches long. Those are the two most common, although you'll also find the Ozark crayfish on occasion. 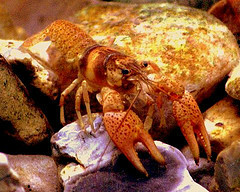 It's typically a tan or orangish colored crayfish with numerous black bands and speckles on the body, and typically tops out about three inches in length. It's most often found in cobble and small chunk-rock areas, as well as gravel banks and points. 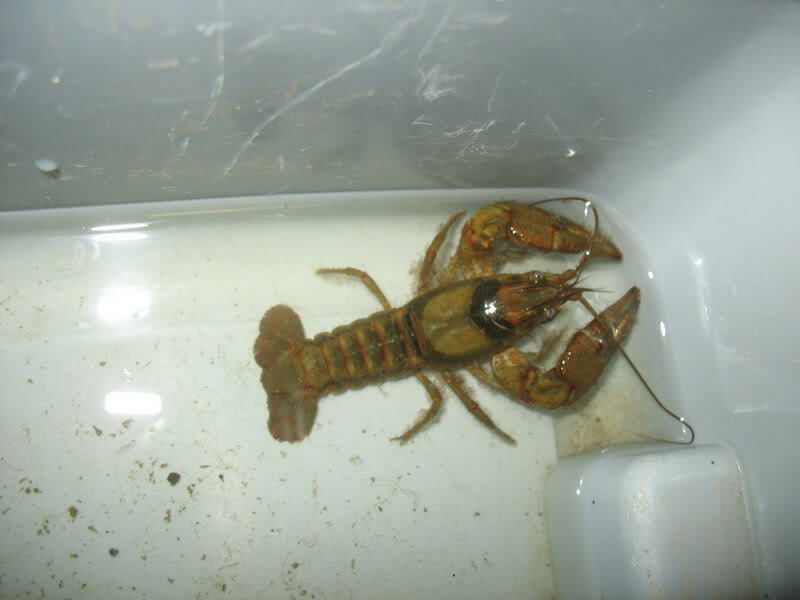 You may also occasionally find the ringed crayfish, which gets about the same size and is typically tan or olive mottled with black. Those four species are probably 99% of what you'll find in Table Rock- imitate them and you should be pretty well covered. Good luck!